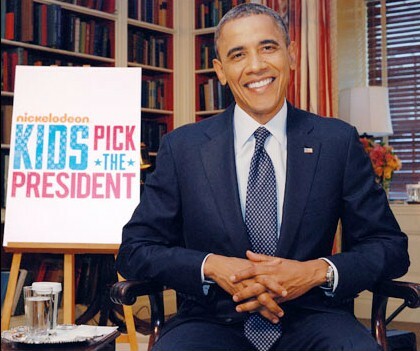 *Republican presidential candidate Mitt Romney declined an invitation from children’s network Nickelodeon to participate in its “Kids Pick the President: The Candidates” special. According to a release from Nickelodeon, Romney’s camp said he was unable to fit the taping into his schedule after multiple attempts from the network. The former Massachusetts governor will still be featured in the special, with producers selecting previously taped clips from the campaign trail in which Romney addresses various issues raised in the kids’ questions. The special, part of “Nick News With Linda Ellerbee,” premieres Oct. 15 at 8 p.m. On Oct. 22, Nickelodeon will reveal the results of its Kids’ Vote poll, which has correctly predicted the winner of five of the last six presidential elections. Nick News is produced by Lucky Duck productions and is now in its 21st year. It is the longest-running kids’ news program in television history. Mit Romney?, is a greedy, lying, stupid, racist….snob! The End.